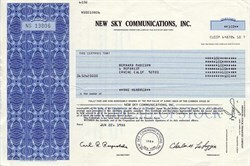 Beautiful uncancelled certificate from the New Sky Communications, Inc issued in 1988. This historic document was printed by the Security Columbian Company and has an ornate border around it with a vignette of an the company name. This item has the printed signatures of the Company’s President, Charles M. LaLoggia and Secretary, Carl R. Reynolds, and is over 21 years old. New Sky Communications, Inc., was founded in 1984 based in Rochester, New York. New Sky Communications, Inc.. The principal activity of the Company is to develop and produce theatrical motion pictures and home video cassettes. The Company is participating in the development of other film properties with a co producer named Syracuse productions LLC and are pursuing development of a screenplay for each film.